Gumbo is a stew or soup originating in Louisiana which is popular across the Gulf Coast of the United States and into the U.S. South. It consists primarily of a strong stock, meat and/or shellfish, a thickener, and the vegetable "holy trinity" of celery, bell peppers, and onion. Left: Roux-less gumbo with okra. The key ingredient is okra, from the African name of which the dish takes its name. Gumbo is traditionally served over rice. There is also a traditional meatless lenten variety called gumbo z'herbes (from the French gumbo aux herbes), essentially a gumbo of smothered greens thickened with roux. Having originated in New Orleans, Louisiana, created by the French, but enhanced by additions from other cultures, gumbo is the result of the melting of cultures in Louisianan history. For example, the dish itself is based on the French soup bouillabaisse, along with the "Holy Trinity," which is of Spanish origin—the ingredients are similar to a sofrito—and the use of filé powder (ground sassafras leaves) which is Native American. A typical gumbo contains one or more kinds of poultry, shellfish, and smoked pork. Poultry used is typically chicken, duck, or quail. Local shellfish such as the freshwater crawfish and crab and shrimp from the Gulf of Mexico are frequently used. 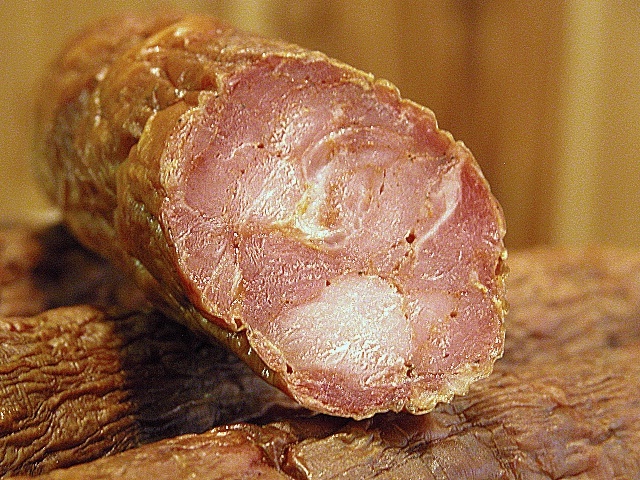 Tasso ham and andouille sausage provide a smoky flavor to the dish. Left: Andouille sausage, a gumbo ingredient. Gumbos can be broadly divided between those that use okra as a thickener, and recipes using filé powder. Roux may be added to either. Another division in types of gumbo is between Creole and Cajun styles. Creole gumbos generally use a lighter (but still medium-brown) roux and include tomatoes, while Cajun gumbos are made with a darker roux and never contain tomatoes. Tomatoes are used in Creole gumbo due to the influence of Italian immigrants to the city. Gumbos can be broadly divided into three categories: those thickened with okra, those thickened with filé powder, and those thickened exclusively with roux. Modern recipes of both okra and filé categories generally call for a roux that provides additional thickening and flavoring. Okra and filé powder are, at least historically, not used together in the same dish. You may, however, see a lighter roux combined with roped (sautéed plain to remove the 'stringy' effect) okra and topped with filé after cooking for the sweet flavor. Filé powder, ground dried sassafras leaves, was in wide use by the native Choctaws when European colonists arrived. In modern recipes, filé gumbos use roux as their primary thickener, with filé powder added as preferred at the table by the eater. A dark roux as used in a Cajun gumbo is cooked until extremely dark. Butter will burn if used to make this type of roux, so lard or oil are the fats of choice. If the roux is to be used with okra, a lighter color may be desired, as the flavor of a dark roux is quite overpowering. Most Creole gumbos do not use as dark a roux as the Cajuns, but a medium reddish-brown type roux; the word roux is a french word that means "russet-red." The "holy trinity" of onion, celery, and bell pepper will often be cooked in the hot roux itself before the stock is added. 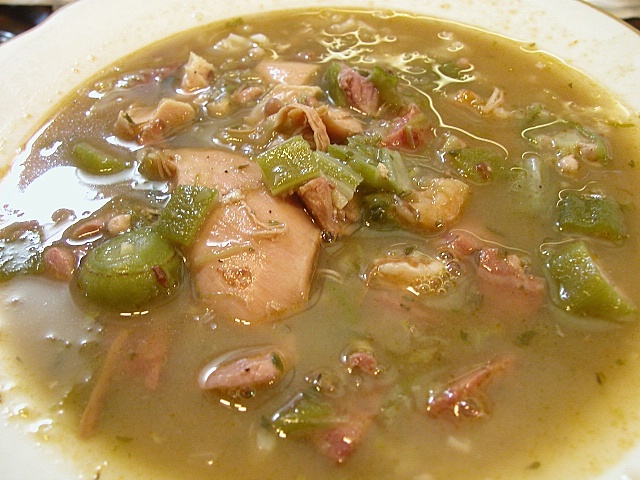 The traditional practice of using okra in the summer (in season) and filé in the winter has played a role in defining the kinds of gumbo usually associated with each. These associations are not hard and fast rules, but more of a general guide. For example a purely seafood gumbo is usually not thickened with filé, while one that is purely meat and game would usually not have okra. This reflects traditional practices of fishing and crabbing in warmer weather and hunting and butchering in cooler weather. Steamed or boiled long-grained rice is usually eaten with gumbo. The ratio of soup to rice is a matter of personal taste, and varies from "damp rice" to a little rice in a bowl of broth. Traditional side dishes include potato salad (sometimes instead of rice, from the influence of German immigrants in the 19th century), fresh New Orleans style French bread, crackers, and baked sweet potatoes. Below is a simplified recipe of Chicken and Andouille Sausage Gumbo - a soup or stew which is thickened using okra and dark roux from the southern United States. Advice: Use home-made chicken stock instead of water. Water has no flavor by itself, and store-bought chicken stock has way too much salt. Brown outside of chicken breasts in small amount of oil then set aside. Make a roux in a large saucepan. Add Trinity to roux and soften. Cut up chicken breasts and add to gumbo to cook until done. Slice up pre-cooked andouille sausage and add 1/2 hour later. Serve in a bowl with a little rice and green onions on top. Hot sauce can be added to taste. Filé may be added to thicken individual servings as served. Gumbo will be better if left over night and eaten the next day.